The first day of meetings of the National Committee on Uniform Traffic Control Devices Committee started off in the afternoon with a discussion about the comments that were received on new sections proposed for a future Manual of Uniform Traffic Control Devices (scheduled now for 2017). This effort is part of the review to vet the materials that are new to the MUTCD. It's worth describing some of the practices of the Committee and to critique how it might be better. A criticism to make the time more productive is to invite presentations of research to address the comments and to inform the Technical Committee. Presentation of research prior to the conversation to the members would increase the expertise around the table. Most of what goes into the Manual in the Bicycle Section is based on the best information available from the people around the table at the meeting. What NACTO was able to do was to gather information from engaged stakeholders without requiring specific travel to finish the document. A face to face review of the materials would have made it better, but if you have people engaged in the process and it is participatory, it can be very powerful (Wikipedia comes to mind as a pretty darn successful model). At the NCUTCD there is a certain amount of discussion around the table of whether the participants know of new treatments and whether they have "worked" or not. Portland is often cited as an example where these new treatments has been applied and there are times when the professionals in the room are not familiar with the information other than having the comments and the original discussion about how they have been written for the Chapter and some limited knowledge of how these treatments have been applied. There was some criticism of NACTO in that there isn't a full vetting process of some of the treatments in their documents, i.e. the general public has not had a chance to comment. The reality of the work in the Urban Bikeway Design Guide is that is that is a collection of work and practices implemented in major cities that are not represented on the National Committee of Uniform Traffic Control Devices and since it is not a standard, it's a collection of practices. NACTO uses the MUTCD concepts of options, "standards", etc. The examples below are not uniform, but the pieces are largely similar. Uniformity at lower speeds is less necessary in my perspective and a discussion of the potential to confuse motorists has not been demonstrated in research. In summary, the NACTO Urban Bikeway Design Guide highlights specific treatments and examples that provide information about how two stage queue boxes have been applied. 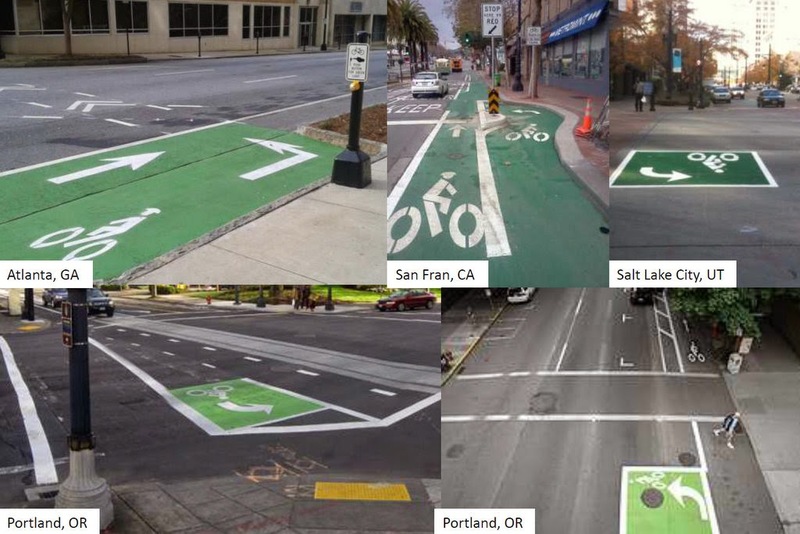 Submissions by City staff involved in NACTO although not fully vetted through research, is informed by practice. A professional could argue that City staff are as knowledgeable about the effectiveness of their treatments as researchers that study the treatments for a few days in a more comprehensive way at sites in order to get a statistically valid sample. Yet, there are criticisms of that approach as well and while the NACTO guidance is not vetted in the classic research sense, the authors are familiar with the applications and the practical experience is used to adjust the treatments to make them effective based on customer complaints. One of the other challenges of the NCUTCD group is that the technical committees meet separately so the entire Signals Committee rarely talks to the Bicycle Technical Committee nor the Roadway Markings Committee, etc. If the National Committee is to continue to be the national experts on traffic control devices, the group has to do a better job of: getting research presented as a part of the consideration of new devices, exploring treatments that are being implemented in the field, cross training NCUTCD members on context sensitive design, and advocate for increased funding for research that identifies innovative techniques to move people safely in urban areas.